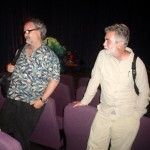 On May 17 John Shirley and Daniel Marcus were out guests. 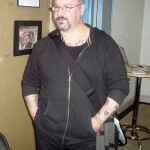 Rick Kleffel’s podcasts of the event are available from the links below. 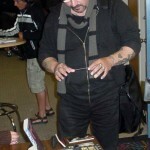 In the audience Rick found punk musician turned writer Johnny Strike, and took the opportunity to interview him as well. 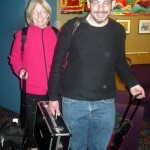 Rick Kleffel and his wife, Claire, arrive with the podcasting equipment. 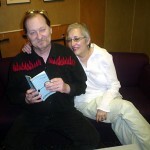 John Shirley checks his material, helped by his wife, Micky. Jude Feldman of Borderlands Books and Jeannine Klein of Litquake. Richard is about to pounce on some books. Daniel Marcus (left) and Carter Scholz (right).